We’ve got some interesting news for Transformers Cyberverse, the upcoming new Transformers series. We’ve known for a while that Windblade would be in the series as an ally to Bumblebee – and it looks like Slipstream will be joining the Decepticon side. Lianne Marie Dobbs posted on Instagram, announcing that she would be voicing Slipstream, in a recording session where she recorded in Miami with the director and writer joining in virtually from NYC and LA respectively – which itself is a testament to how far the technology of recording sessions has come in 35 years. It’s the last part that is interesting. As well as confirming Slipstream will be in the show, it confirms that she has stepped up to lead the Seekers – as well as the more obvious reveal, we’re getting Seekers in Cyberverse! Slipstream being their leader rather than the role going to Starscream hints that while Cyberverse is generally going for the Generation 1 approach, the writers are also mixing things up, so it is not impossible that the Seekers this time out might sport a different lineup too (or be generics). It’s also nice to see some more female representation in the series, and who knows, perhaps we can get Strongarm or even a new female character added to the cast as it goes. 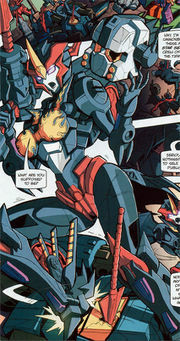 Moreover, we cannot help but speculate if Slipstream’s inclusion might lead to her being a foil for Windblade, less because they’re both female characters, and more because they are both flight type characters. Not to mention – will Slipstream leading the Seekers provide some much-needed intra-Decepticon drama with her butting heads with Starscream? We’ll find out when we get to see Transformers Cyberverse later this year. 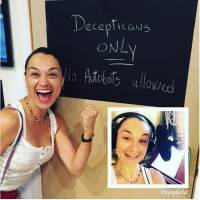 For those wanting to know more about the voice behind the Decepticon, according to the IMDB, Lianne Marie Dodd’s previous voice credits include various roles in the Pokemon series, as well as other roles including in 30 Rock, Black Mask, and Surprise, as well as a resume that includes a variety of theater roles. I kinda wish they’d do another AEC where most of the assumptions were tossed out the door (ok so the movies kinda do that) It’s nice that Animated, Aligned, and Cyberverse strayed a bit from G1 here and there (Animated Prowl, Prime Arcee, RID15 Grimlock) but at what point does something become so G1 that it’s just… another version of G1? Like the difference between the toys, Marvel, Dreamwave, IDW, etc? Or just perhaps there's a general shift in acceptance of "nerd" culture. Isn't this going against the point you're trying to make? Let's say we have the same 5 characters appear the next 5 Transformers show. What happens next? Someone isn't going to start watching Transformers media out of nowhere. Nothing is going to change. Yes, I agree basic foundational things matter. I haven't said anything that contradicts that. However, throwing in a new character or a new idea isn't going to break that foundation. Transformers isn't some obscure franchise or anything. If people wanted to get into, they would have already done so. I don't see how stagnating this brand with limited variety is helping this cause. Consistency does not equal stagnation, it in fact gives outside onlookers something to hang on to and identify. Um, have you ever watched anything from the past decade? He has literally been the same character. It doesn’t matter that he keeps changing, the fact is starscream has been a prominent character in every single transformers series that have aired in America aside from 3. He is far from obscure and if you can’t see that then you are blind. If you think joe random hardly know who optimus prime is then you’re also deluded.